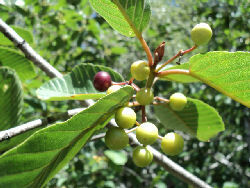 Shrub, small tree, < 10 m. Stem: branches alternate, stiff or flexible; twigs generally not thorn-tipped; winter bud scales present, generally ± 3 mm. 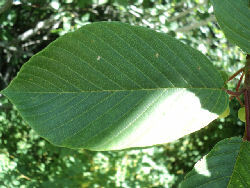 Leaf: scattered along branches or clustered on short-shoots, deciduous or evergreen; stipules generally deciduous; petioles generally glabrous; blade veins prominent or not. Inflorescence: flowers 1 or in cyme-like clusters in axils. Flower: unisexual (bisexual), generally on separate plants, generally < 3 mm; hypanthium bell-shaped to cup-like, 2–3 mm wide; sepals 4–5, thin, spreading, not keeled adaxially; petals 0 or 4–5; disk thin, adhering to hypanthium; ovary appearing superior or partly inferior, chambers 2–4, each 1-ovuled, style 1, stigma 2–4-lobed. Fruit: drupe, 2–3-stoned.